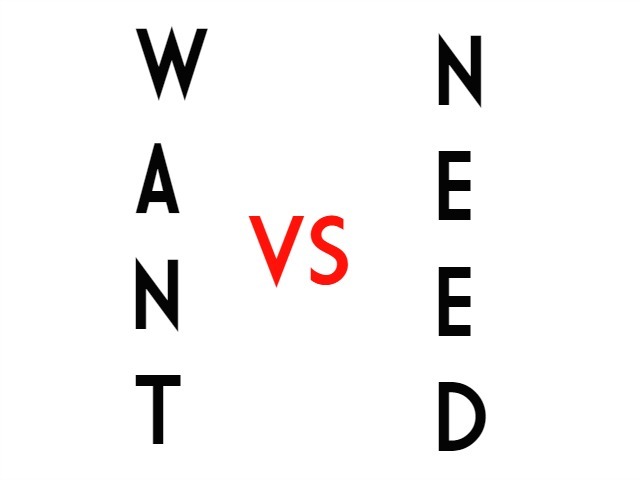 I know I have blogged about this before but for some reason lately I have been getting into more and more conversations with people on the difference between a want and a need. There are times when a need and want are hard to clearly define and wants can become needs depending on circumstances. The key is to figure out your own wants and needs. All of our wants and needs are going to be different. But you do need to sit down and figure out what yours are. Let's give an example... you need a sweater for winter because your other one is worn out or too small. Do you need that new designer sweater for $80 you saw at the mall last week or will one for $15 do just the same and keep you just as warm. I do realize that there is a difference sometimes in quality... I know that first hand... I usually buy our clothes from brand name stores and shy away from Big Box stores because one the quality is usually better and also the prices are better at the brand name stores if you shop the sales and look for their discounts. Prioritizing is so hard not to mention at times no fun but once you get down what you truly need vs what you want you will find life a lot simpler. I am speaking from experience. Just give it a try... sit down and make a list.